Recently right atrial septal (RAS) pacing is often selected, but the benefit brought by RAS pacing has not been clear. 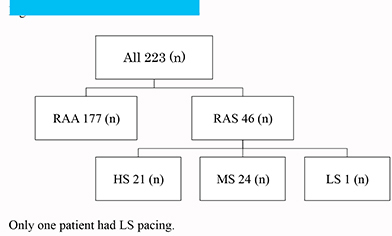 The aim of this study was to evaluate the differences between RAS pacing and right appendage (RAA) pacing. 223 consecutive new patients with a right atrial (RA) electrode during the period from January 2004 to December 2012 were studied retrospectively. They were observed regularly at our pacemaker (PM) clinic, and we measured paced P - sensed QRS interval (pPQi) and left atrial dimension (LAD) during the observation period, furthermore the onset of atrial fibrillation (AF) was assessed. Mean age was 74.5 years and 104 were men. Mean follow-up period was 4.5 years. 177 patients received RAA pacing and 46 received RAS pacing. There was no difference of LAD and pPQi between patients with RAA pacing and with RAS pacing with more than 50% of percentage as the atrial pacing (%AP). About the comparison between intrinsic PQ interval and pPQi, only RAA pacing made long significantly from intrinsic PQ interval to pPQi (p=0.020, 172.3±46.3 vs. 189.7±38.0). The %AP more than 50% brought less probability of the onset AF. On the other hand, none of pacing sites of RA, pacing mode, and the percentage of ventricular pacing influenced on the probability of the onset of AF. Although in patients with 50% as %AP RAA pacing made patients with AF increased (from 17 to 22), RAS pacing made them decreased (from 14 to 12). This study did not show the superiority of RAS pacing to RAA pacing, it seems that %AP is more important for the onset of AF. The possibility was seen that RAS pacing reduces the onset of AF. Key Words : Right Atrial Septal Pacing, Paced PQ Interval, Atrial Fibrillation, The Percentage Of Atrial Pacing. Correspondence to: Mariko Tanaka, Department of Cardiology, Japanese Red Cross Wakayama Medical Center, Wakayama, Japan. Many patients with bradyarrhythmia need atrial pacing and recently alternative pacing sites instead of right atrial appendage (RAA) pacing are featured to prove efficacious in preventing various supraventricular tachyarrhythmia.1-7 Especially, several clinical studies have demonstrated that lower right atrial septal (LS) pacing is associated with shortened inter-atrial conduction delay and decreased P-wave duration1,7-13 and LS pacing reduces the recurrence of atrial fibrillation (AF) compared with traditional RAA pacing.7,12 However, some patients cannot receive LS pacing. We sometimes implant a right atrial (RA) lead in high atrial septum (HS) or mid atrial septum (MS) because the prevalence of far-field R-wave (FFRW) sensing in the LS region is high.5 It has not become clear what differences are brought by HS or MS pacing compared with RAA pacing. 223 consecutive new patients with a RA electrode during the period from January 2004 to December 2012 were studied retrospectively. 104 patients were male and 119 were female, their ages ranged from 27 – 93 years (mean (SD), 74.4 (9.3)), and mean follow-up duration was 4.5years (Table 1). They were observed regularly at our pacemaker (PM) clinic every 3-6 months, and their baseline characteristics, clinical status, medical therapy, device memory were retrieved from medical records and device. They had at least one of sick sinus syndrome (SSS), atrioventricular block (AVB) or both of them, and prior paroxysmal atrial fibrillation (PAF) was detected by 12-lead surface electrocardiogram (ECG) in 52 patients. The site of RA lead was assessed by fluoroscopic images at right anterior oblique (RAO) and left anterior oblique (LAO), chest X-ray, and P wave morphology in II and V1 leads on ECG. We defined HS as the position that brought positive P wave in II lead on ECG, and LS pacing gave negative P wave in II lead. We recognized MS pacing brought both of positive and negative P wave in II lead and RAA pacing revealed negative P wave or both of positive and negative P wave in V1 lead. All patients were performed ECG and echocardiography at PM implantation, and paced P - sensed QRS interval (pPQi) on ECG was measured and M-mode echocardiography was done to measure left atrial dimension (LAD). ECG was performed every year and echocardiography was done when patients appeared for chest discomfort, any cardiovascular event, or tachyarrhythmia was detected by device during the follow-up period. PAF was defined when it continued more than 30 seconds and persistent atrial fibrillation (PeAF) was defined if AF continued during two times of PM check. Survival free from PAF or PeAF was also evaluated. Analysis: Data are presented as mean ± SD, a value of p <0.05 was considered statistically significant. For continuous variables, 2-group comparisons were performed with the parametric 2-sample t test or Mann-Whitney test. To identify differences in one patient between two time points, a paired sample t-test was used, when the data was not normally distributed, a Wilcoxon signed ranks test was used. And statistical analysis was done with one-way analysis of variance or with Kruskal-Wallis analysis of variance when assumptions of normality of the distribution or homogeneity of variances were not verified. Survival from PAF or PeAF was estimated using Kaplan-Meier methods, and relative risk and 95% confidence interval were calculated by Cox proportional hazards methods. Statistical analysis was performed with JMP 9.0.1. Baseline characteristics of the study population is shown in Table 1. 52 patients had PAF at PM implantation and the percentage of patients with PAF for all patients with RAS pacing was more than that with RAA pacing. There was no significant difference of medical history between patients with RAS pacing and RAA pacing. 78% of antiarrhythmic agents were given to patients with AF and there was no difference of medication between patients with RAS pacing and them with RAA pacing. PM programming is shown in Table 2 and no patient with RAS pacing had AAI mode. Position of RA electrodes is revealed in Figure (Fig.1), only one patient had LS pacing. So, the evaluation was done among patients who had one of RAA, HS, or MS pacing. 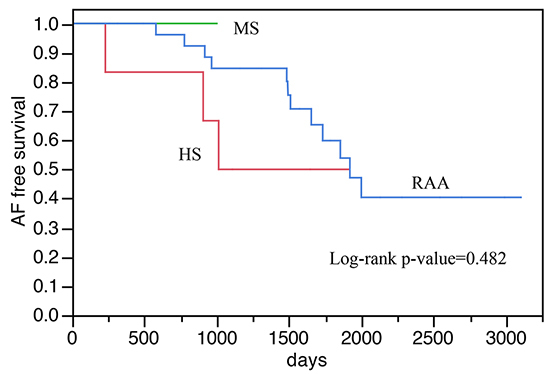 P-wave sensing with RAA pacing at PM implantation was higher than that with HS and MS pacing, but the difference disappeared during follow-up period (Table 3). Threshold with HS pacing was significantly high through an observational period and impedance with RAA pacing was higher than that with HS and MS pacing. Among patients with RAA, HS, and MS pacing, there was no significant difference of LAD and left atrial percent fraction shortening (LA%FS) in patients with more than 50% as the percentage of the atrial pacing (%AP) (Table 4). LA%FS was measured as one of the indices of left atrial (LA) pump function. Similarly, there was no difference of pPQi in patients with %AP>=50% among patients with RAA, HS, MS pacing, but pPQi was clearly longer than intrinsic PQ interval in patients with RAA pacing (Table 5). Survival free from PAF or PeAF is shown Fig. 2-Fig. 4. The appearance of AF with RAA pacing was similar to that with HS and MS pacing in patients with SSS and without AF before PM implantation (p=0.482, Fig. 2A). In patients without AF before PM implantation, patients with SSS clearly tended to have AF regardless of atrial pacing sites compared with patients with AVB (p=0.014, Fig. 3). In patients with prior AF, the incidence of AF in patients with %AP>=50% was significantly less than that in patients with %AP<50% (p=0.029, hazard ratio (HR) 2.19 (confidence interval (CI): 1.04-4.47), Fig. 4A), and this tendency was also recognized in patients with SSS and with prior AF (p<0.001, HR=3.76 (CI: 1.63-8.48), Fig. 4B). On the other hand, the %AP didn’t bring any difference on free from AF in patients without AF (%AP>=50% vs. %AP<50, P=0.246, HR=1.49 (CI: 0.73-2.90)). Furthermore, pacing mode did not any influence on occurrence of AF (comparison among automatic mode switch between AAI and DDD (AAI-DDD), DDD, and DDI in patients with prior AF, P=0.776, and comparison among AAI-DDD, DDD, and AAI in patients without prior AF, P=0.489), and similarly the percentage of ventricular pacing (%VP) did not any influence on the onset of AF (%VP <80% vs. %VP>=80 in patients with prior AF, p=0.313, HR=0.65 (CI: 0.29-1.64), and %VP<80% vs. %VP>=80% in patients without prior AF, p=0.502, HR=1.26, (CI: 0.64-2.43)). Although the number of patients with AF with RAS pacing increased from 21 to 22 and that with RAA pacing increased from 30 to 54, in patients with >=50% as %AP RAS pacing decreased the number of patients with AF (from 14 to 12) while RAA pacing increased it (from 17 to 22) (table 6). AF is arrhythmia that can give a big influence to the life including risks of stroke and heart failure.14,15 There are many patients needing atrial pacing in the clinical situation and AF develops with constant probability. When we had only tined leads, we did not have a choice other than right appendage as the place to implant an electrode, but it is now able to choose the position to implant atrial lead after screw-in leads appeared.16 Then, which is the best location of RA to implant in an electrode? It was reported that to pace both atria simultaneously from a single site using a standard active fixation lead guided by transesophageal echocardiography (TEE) and fluoroscopy was possible16 and interatrial septal pacing was a safe and feasible technique providing satisfying success rate in long-term maintaining sinus rhythm17 and therefore we expected a better effect of RAS pacing. It was reported that LS pacing made pPQi shorter. Actually it is not difficult for us to implant RA lead in LS,6 but in almost all cases at our hospital implantation of electrode in LS was impossible because of FFRW.5 This study included only one case with LS pacing, so comparison was accomplished among patients with HS, MS and RAA pacing. Although there was no significant difference of pPQi among patients with HS, MS, and RAA pacing, pPQi caused by RAA pacing was clearly longer than intrinsic PQ interval. 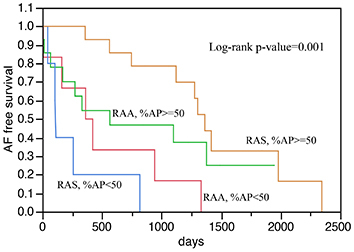 It seems that RAA pacing is not physiological in the atrium electrophysiologically, and it is thought that RAA pacing causes dysshynchronized contraction of the atrium and it might bring the remodeling of the atrium as a result. And more, longer pPQi will bring unexpected ventricular pacing, too. It was also reported about the possibility that longer pPQi causes more frequent occurrence of AF.13 Furthermore, this study did not show any difference of LAD and LA%FS among pacing sites in RA. LA%FS is recognized as reference for an index of LA pump function, and the differences of atrial functions such as atrial volume and velocity should be evaluated, but it was difficult for us to evaluate them except LAD and LA%FS because this is retrospective study. Unfortunately the evaluation of LA pump function was insufficient in this study. On the other hand, there was a report that LAD is affected by pacing sites in RA.9 It is thought that non-physiological atrial pacing will cause extended LAD, so RAA pacing may extend LAD during a long-term observation period. Thus RAA pacing is not considered as the appropriate pacing site for atrial pacing. However some reports show that ventricular pacing influences on the onset of AF,18 the percentage of ventricular pacing wasn’t related with an appearance of AF in this study. It is considered that VVI pacing brings the onset of AF more than DDD pacing,15,18,19 and since this study excluded patients with VVI pacing, consequently it seems that physiological ventricular pacing such as DDD pacing brought little difference about the onset of AF compared with AAI pacing or AAI-DDD pacing in this study.18,19 And more, although Sweeney et al. reported that AAI-DDD reduces PeAF in patients with SSS,25 there is not a significant difference about the onset of AF between AAI-DDD and DDD in this study. AAI-DDD is useful for the onset of PeAF, but it is thought that AAI-DDD does not affect the onset of PAF. 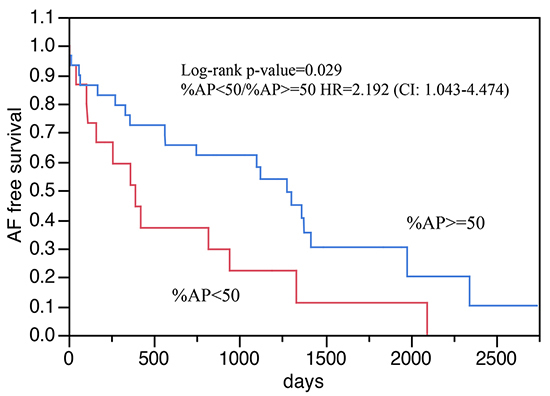 This study showed that the higher %AP brought higher probability of free from AF (Fig.4A-4B). Especially, in patients who had SSS and PAF before PM implantation, the higher %AP suppresses an appearance of AF after PM implantation. This shows that atrial pacing has possibility of the suppression of the onset of AF. However, how should we decide the optimal pacing rate settings? Several studies have documented that RAS pacing or overdrive atrial pacing couldn’t suppress PeAF,19-24 so an advanced study is expected about that in the future. And in patients with more than 50% as %AP RAA pacing increased the number of patients with AF (from 17 to 22), RAS pacing decreased them (from 14 to 12). Unfortunately, it was not enough number of patients to assess significant difference. Furthermore, in patients with SSS and AF before PM implantation RAA pacing also decreased the number of patients with AF, thus perhaps any pacing sites in RA might be able to suppress the occurrence of AF in patients with SSS and AF before PM implantation. But as a whole RAA pacing increased patients with AF compared with RAS pacing, so there is a possibility that RAS pacing may decrease the onset of AF. Fig. 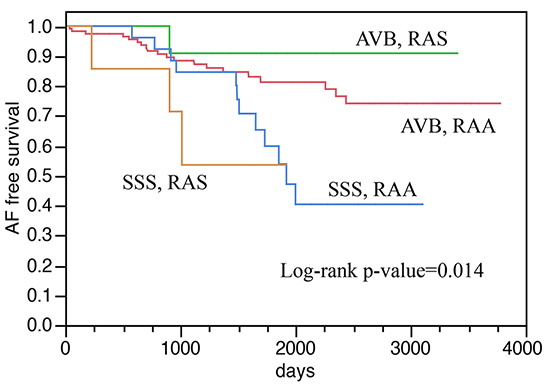 3 shows SSS brings more easily the onset of AF than AVB after all. We should implant an atrial electrode in RAS instead of RAA for patients who have SSS and prior PAF, and we should set programming up to be higher %AP. This is a retrospective, single center study and it includes a small sample size. The background of patients at a PM implantation was very various and it is not denied that intention of doctors affected treatment to patients. 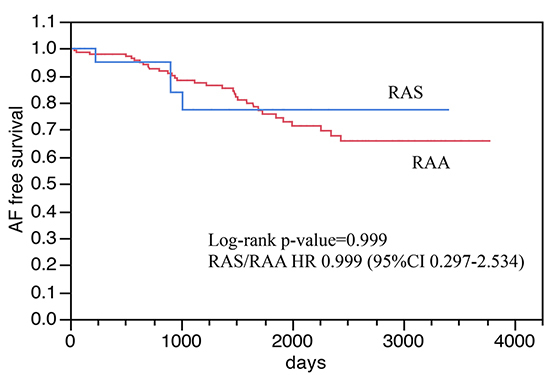 This study did not show the superiority of RAS pacing to RAA pacing clearly, but there is a possibility that RAS pacing controls the onset of AF and RAA pacing should not be selected because it brings longer pPQi. 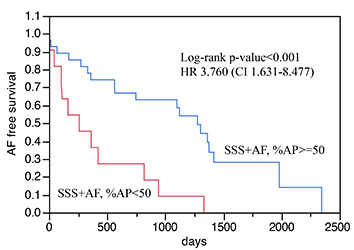 The higher %AP seems to make less onset of AF. I gratefully acknowledge the help from the clinical engineering technologist: Mitsunori Maeda, C.E., Toshinari Moriwaki, C.E., Nobuya Nakatani, C.E., Shigeru Yamasita, C.E., Hideyuki Minamimura, C.E., Takatomo Jou, C.E., Masaki Matsumoto, C.E. Katsivas A, ManolisA G, LazarisE, VassilopoulosC, LouvrosN. Atrial septal pacing to synchronize atrial depolarization in patients with delayed interatrial conduction. Pacing Clin Electrophysiol. 1998;21 (11 Pt 2):2220–5. Roithinger F X, Abou-HarbM, PachingerO, HintringerF. The effect of the atrial pacing site on the total atrial activation time. Pacing Clin Electrophysiol. 2001;24 (3):316–22. Bailin S J, AdlerS, GiudiciM. Prevention of chronic atrial fibrillation by pacing in the region of Bachmann's bundle: results of a multicenter randomized trial. J. Cardiovasc. Electrophysiol. 2001;12 (8):912–7. 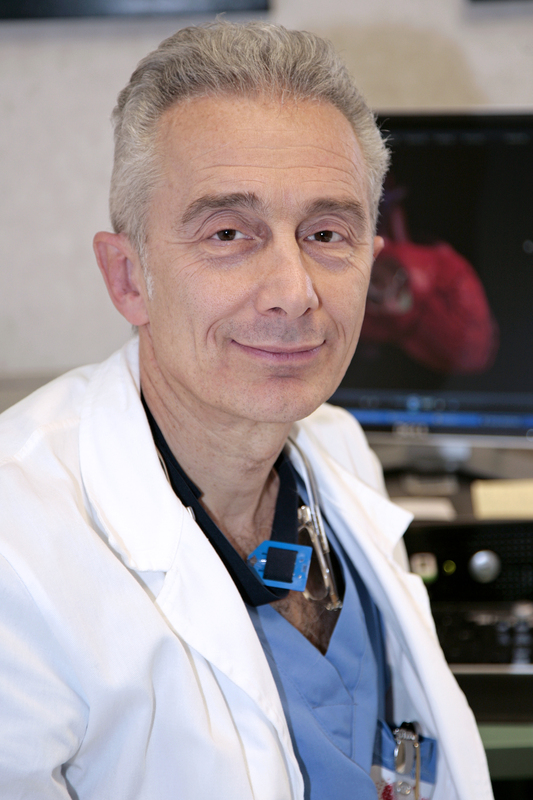 Padeletti L, PorcianiM C, MichelucciA, ColellaA, TicciP, VenaS, CostoliA, CiapettiC, PieragnoliP, GensiniG F. Interatrial septum pacing: a new approach to prevent recurrent atrial fibrillation. J Interv Card Electrophysiol. 1999;3 (1):35–43. Minamiguchi Hitoshi, AbeHaruhiko, KohnoRitsuko, OginosawaYasushi, TamuraMasahito, TakeuchiMasaaki, NagatomoToshihisa, OtsujiYutaka. Incidence and characteristics of far-field R-wave sensing in low right atrial septum pacing. Circ. J. 2012;76 (3):598–606. Minamiguchi Hitoshi, NantoShinsuke, OnishiToshinari, WatanabeTetsuya, UematsuMasaaki, KomuroIssei. Low atrial septal pacing with dual-chamber pacemakers reduces atrial fibrillation in sick sinus syndrome. J Cardiol. 2011;57 (2):223–30. Padeletti L, PieragnoliP, CiapettiC, ColellaA, MusilliN, PorcianiM C, RicciR, PignalberiC, SantiniM, PuglisiA, AzzoliniP, SpampinatoA, MartelliM, CapucciA, BorianiG, BottoG, ProclemerA. Randomized crossover comparison of right atrial appendage pacing versus interatrial septum pacing for prevention of paroxysmal atrial fibrillation in patients with sinus bradycardia. Am. Heart J. 2001;142 (6):1047–55. Papageorgiou P, MonahanK, BoyleN G, SeifertM J, BeswickP, ZebedeJ, EpsteinL M, JosephsonM E. Site-dependent intra-atrial conduction delay. Relationship to initiation of atrial fibrillation. Circulation. 1996;94 (3):384–9. Wang Mei, SiuChung-Wah, LeeKathy Lf, YueWen-Sheng, YanGuo-Hui, LeeStephen, LauChu-Pak, TseHung-Fat. Effects of right low atrial septal vs. right atrial appendage pacing on atrial mechanical function and dyssynchrony in patients with sinus node dysfunction and paroxysmal atrial fibrillation. Europace. 2011;13 (9):1268–74. Acosta Helbert, ViafaraLina Maria, IzquierdoDavid, PothulaVijayasimha R, BearJulie, PothulaShravya, Antonio-DrabeckCynthia, LeeKwangdeok. Atrial lead placement at the lower atrial septum: a potential strategy to reduce unnecessary right ventricular pacing. Europace. 2012;14 (9):1311–6. Watabe Taichi, AbeHaruhiko, KohnoRitsuko, OginosawaYasushi, HayashiKatsuhide, OheHisaharu, TamuraMasahito, TakeuchiMasaaki, OtsujiYutaka. Atrial pacing site and atrioventricular conduction in patients paced for sinus node disease. J. Cardiovasc. Electrophysiol. 2014;25 (11):1224–31. Yu W C, TsaiC F, HsiehM H, ChenC C, TaiC T, DingY A, ChangM S, ChenS A. Prevention of the initiation of atrial fibrillation: mechanism and efficacy of different atrial pacing modes. Pacing Clin Electrophysiol. 2000;23 (3):373–9. Bennett D H. Comparison of the acute effects of pacing the atrial septum, right atrial appendage, coronary sinus os, and the latter two sites simultaneously on the duration of atrial activation. Heart. 2000;84 (2):193–6. Tse H F, LauC P. Prevalence and clinical implications of atrial fibrillation episodes detected by pacemaker in patients with sick sinus syndrome. Heart. 2005;91 (3):362–4. Glotzer Taya V, HellkampAnne S, ZimmermanJohn, SweeneyMichael O, YeeRaymond, MarinchakRoger, CookJames, ParaschosAlexander, LoveJohn, RadoslovichGlauco, LeeKerry L, LamasGervasio A. Atrial high rate episodes detected by pacemaker diagnostics predict death and stroke: report of the Atrial Diagnostics Ancillary Study of the MOde Selection Trial (MOST). Circulation. 2003;107 (12):1614–9. Spencer W H, ZhuD W, MarkowitzT, BadruddinS M, ZoghbiW A. Atrial septal pacing: a method for pacing both atria simultaneously. Pacing Clin Electrophysiol. 1997;20 (11):2739–45. Padeletti L, PorcianiM C, MichelucciA, ColellaA, CostoliA, CiapettiC, PieragnoliP, MusilliN, GensiniG F. Prevention of short term reversible chronic atrial fibrillation by permanent pacing at the triangle of Koch. J Interv Card Electrophysiol. 2000;4 (4):575–83. Lamas Gervasio A, LeeKerry L, SweeneyMichael O, SilvermanRussell, LeonAngel, YeeRaymond, MarinchakRoger A, FlakerGreg, SchronEleanor, OravE John, HellkampAnne S, GreerStephen, McAnultyJohn, EllenbogenKenneth, EhlertFrederick, FreedmanRoger A, EstesN A Mark, GreensponArnold, GoldmanLee. Ventricular pacing or dual-chamber pacing for sinus-node dysfunction. N. Engl. J. Med. 2002;346 (24):1854–62. Nielsen J C, AndersenH R, ThomsenP E, ThuesenL, MortensenP T, VesterlundT, PedersenA K. Heart failure and echocardiographic changes during long-term follow-up of patients with sick sinus syndrome randomized to single-chamber atrial or ventricular pacing. Circulation. 1998;97 (10):987–95. Lau Chu-Pak, WangChun-Chieh, NgarmukosTachapong, KimYou-Ho, KongChi-Woon, OmarRazali, SriratanasathavornCharn, MunawarMuhammad, KamRuth, LeeKathy Lf, LauElizabeth Oi-Yan, TseHung-Fat. A prospective randomized study to assess the efficacy of rate and site of atrial pacing on long-term development of atrial fibrillation. J. Cardiovasc. Electrophysiol. 2009;20 (9):1020–5. Lau Chu-Pak, TachapongNgarmukos, WangChun-Chieh, WangJing-Feng, AbeHaruhiko, KongChi-Woon, LiewReginald, ShinDong-Gu, PadelettiLuigi, KimYou-Ho, OmarRazali, JirarojanakornKreingkrai, KimYoon-Nyun, ChenMien-Cheng, SriratanasathavornCharn, MunawarMuhammad, KamRuth, ChenJan-Yow, ChoYong-Keun, LiYi-Gang, WuShu-Lin, BailleulChristophe, TseHung-Fat. Prospective randomized study to assess the efficacy of site and rate of atrial pacing on long-term progression of atrial fibrillation in sick sinus syndrome: Septal Pacing for Atrial Fibrillation Suppression Evaluation (SAFE) Study. Circulation. 2013;128 (7):687–93. Hermida Jean-Sylvain, KubalaMacIej, LescureFrançois-Xavier, DeloncaJean, ClercJérome, OtmaniAkli, JarryGeneviève, ReyJean-Luc. Atrial septal pacing to prevent atrial fibrillation in patients with sinus node dysfunction: results of a randomized controlled study. Am. Heart J. 2004;148 (2):312–7. Hakacova Nina, VelimirovicDusan, MargitfalviPeter, HatalaRobert, BuckinghamThomas A. Septal atrial pacing for the prevention of atrial fibrillation. Europace. 2007;9 (12):1124–8. Kantharia Bharat K, FreedmanRoger A, HoekengaDavid, TomassoniGery, WorleySeth, SorrentinoRobert, SteinhausDavid, WolkowiczJoel M, SyedZaffer A. Increased base rate of atrial pacing for prevention of atrial fibrillation after implantation of a dual-chamber pacemaker: insights from the Atrial Overdrive Pacing Study. Europace. 2007;9 (11):1024–30. Sweeney Michael O, BankAlan J, NsahEmmanuel, KoullickMaria, ZengQian Cathy, HettrickDouglas, SheldonTodd, LamasGervasio A. Minimizing ventricular pacing to reduce atrial fibrillation in sinus-node disease. N. Engl. J. Med. 2007;357 (10):1000–8.